The two layer construction is designed to stop the rubbing that can cause blisters and also to wick away sweat as these are warm socks designed for winter conditions. The inner is made from NILIT Heat yarn produced using coffee charcoal made from surplus coffee bean shells. Whilst no coffee smell remains, the inner does do a good job of staying fresh, I’ve warn them for consecutive hill days and they’ve been noticeably less smelly than some other socks. However there is a downside, the double layer construction means you have to put them on carefully to avoid uncomfortable wrinkles and the inner seems to pull on the toe seam making that uncomfortable in tighter footwear. Putting them back on after a chilly, winter river wade, was much more difficult that one layer socks so I’d not wear them when wading might be a possibility. Having said that, they do have good support in the arch and the all over padding is very insulating without being overly sweaty. So far they have worn well and have kept their soft feel and deep cushioning. A good value choice for those prone to cold feet in winter conditions. The high merino content gives these mid-calf length, socks a very soft feel. The cushioning is deep with additional padding at the toe, ball of the foot, and particularly useful if you’re prone to a tender achilles, around the heel extending up the back of the ankle to cover the whole achilles heel area. The socks have retained the cushioning well after numerous wears and washes (all socks in this test have been machine washed at 30 degrees on the wool wash setting with no fabric conditioner and left to dry naturally) with only minimal felting at the heel – we would expect these to be long lasting. Of all the socks tested this one had the most noticeable support at the arch. The toe seam is genuinely flat and the fit true to shoe size. Not overly hot or cool presumably, due to the high merino content, the amount of padding means they are more suited to boots and shoes with plenty of space rather and Paul found them warm enough to wear in winter conditions. A good value, durable, well performing all round sock, particularly good if you need to protect your achilles. The thickest socks on test, these have a high man-made fibre content and uniform looped cushioning throughout the calf length sock. When you first put them on they don’t feel as soft and comfortable as some of the higher-wool content socks, but there seems to be just enough wool in the mix to ensure they don’t get overly sweaty or cool. The high level of insulation means they are best for winter days in big boots that can fit a thick padded sock. You’d expect a sock with a high acrylic content to be durable and these have retained their shape and cushioning with only the tiniest amount of felting at the heel and ankle cuff after numerous wears and washes. A good value, heavy duty sock for colder weather, Alpkit also do an even longer length version. At first glance these ankle socks didn’t look particularly promising, especially given their high (for Alpkit) price. Slightly thicker than a normal cotton sock and with additional cushioning on the underside and heel I found them surprisingly comfortable, cool and most importantly non-smelly during hot weather days. I wore them continuously for 5 days hiking in the Alps in trail shoes and found there was no rubbing (the toe seam is completely flat), they wicked well, had the right amount of cushioning for off road walking, and really didn’t smell at all despite not washing them. Having worn them a lot since the summer they are proving to be robust and should be long lasting. 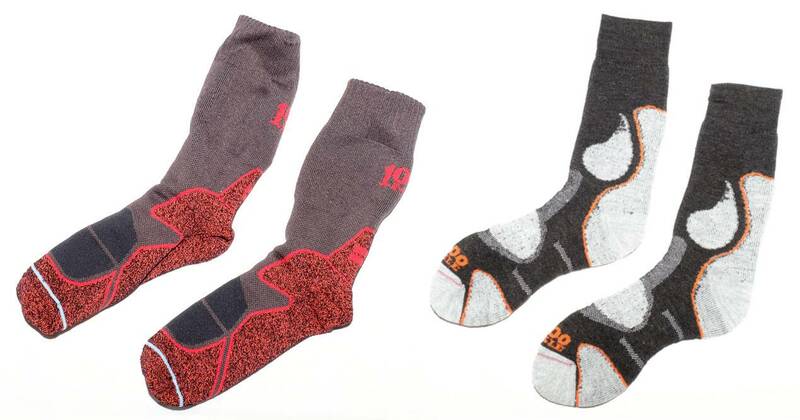 Alpkit says the high price is due to the use of silver to give the socks their anti-microbial qualities. A useful warm weather sock for both walking and cycling. A very thick, well cushioned mid-calf sock with increased padding at the toe, ball and heel. Added arch support with an elasticated section above the heel to keep the sock in place and a tighter cuff than many other heavy weight socks. Definitely one for cold weather only, it breathes reasonably well and has a good level of cushioning and insulation for long, cold days. The sock type is indicated on the sock for ease of sorting. The socks appear durable, which they should be at the relatively high price, but have gone a bit “cardboardy” losing their softness after a number of washes. A good performer in trail shoes for warmer days, this ankle height sock has a thinner panel on the top to aid breathability and good elasticated arch support. There is an adequate layer of padding at the toe, ball and heel meaning these can be worn for long days. For an ankle sock I could have done with less ankle height to keep them cooler but it does mean they can be worn with mid-height boots. After months of wear they have gone a bit bobbly and the heels have lost some cushioning so whilst they are robust I’m not expecting these to be the longest lasting pair of socks on test. A lighter weight, mid-calf height sock from endurance sock makers, Darn Tough, this has proved comfortable and robust for warmer weather walking. Mid weight cushioning where you need it at the heel, toe and ball, the rest of the sock is thinner and combined with the mix of merino and nylon this seems to make it reasonably breathable. The socks grip the foot with no slipping even in very hot conditions and work well for long days in both mid height boots and trail shoes. This has been my sock of choice for long hill days in cooler weather wearing boots, for the last few years. Recommended to me by an obsessive long distance hiking friend, they have lived up to their brand name and appear to be fairly indestructible. Very comfortable, with a good level of cushioning that is uniform throughout the sock (which may not suit those seeking a cooler or less bulky sock), the toe seam is completely flat and the elasticated ribbed design above the ankle means there’s no chance of the sock slipping down. It also seems to smell less when wet than some of the other socks. They do lose a degree of cushioning and comfort over time (not really noticeable until a year into use) but generally they are extremely robust. 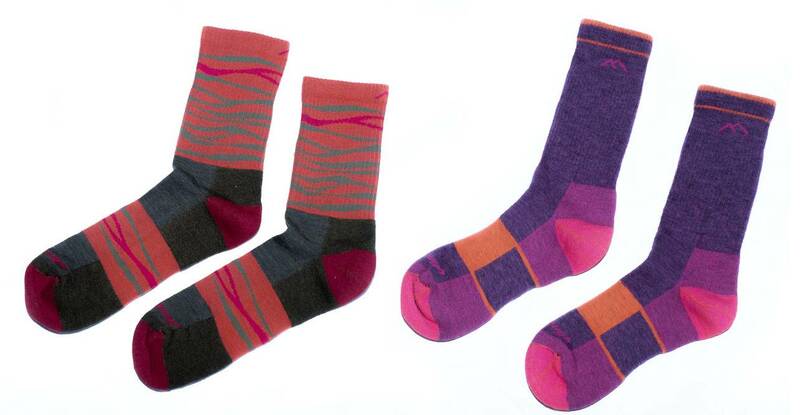 If you like to show off your socks they come in a jazzy range of colours and designs. On the expensive side, but I’ve not had to test out the lifetime guarantee yet, so to my mind they’re good value. Smartwool socks always feel extremely soft and luxurious to touch when new, and these – which are lighter weight than the ones I’ve tried in the past from the brand – are no exception. Their light cushioning makes them ideal for wearing with trail shoes, and the high merino content for such thin socks helps make them very comfortable to wear. Durability seems good, with some bobbling after several washes – we’d always recommend using wool wash to get the best from your socks – and there are no thinner worn patches as yet. The price is towards the high end for this type of sock – in line with Smartwool’s relatively high pricing on their heavier-weight pairs. Super comfortable, these are reliable, calf length socks. The medium refers to the level of cushioning, and this combined with arch support, fairly unobtrusive toe seam and good breathability mean these have often been my socks of choice for cooler weather long day walks. They have lasted well but don’t retain the high initial level of cushioning after the first few washes. If you’re washing and sorting socks for a large household the fact that the size is woven into the cuff makes pairing up easier. I found the sizing slightly on the long side so choose the size carefully. A good choice for boots or trail shoes that have plenty of room, for winter conditions I prefer the high insulation of the heavier weight Smartwool models.